Bridgeport resident Christina Lopez said she can never say "thank you" enough after NBC 5 viewers and strangers came together to help her family after Tuesday's devastating tornado. Lopez said she was home with her husband when her son called her warning her about the storm. The couple, who lives in a mobile home, tried to escape. "We got in [our] truck and was trying to leave. The gate would not open, it slammed shut. We turned around and came back. I mean, it all hit," said Lopez. A dog is reunited with her family in Bridgeport after being separated from them during severe overnight storms. Lopez said at that moment the tornado hit and a massive tree fell on the couple's truck. "We thank God for being alive. I think if the tree wouldn't have fallen on our truck we probably wouldn't be here today because [the tornado] did lift up that truck and it slammed us back down. I mean we were in it," she said. 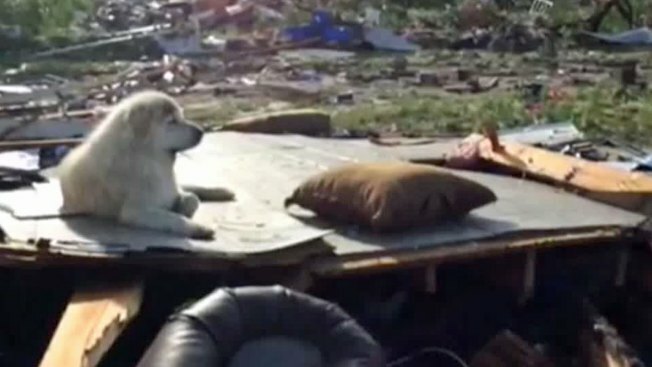 After the tornado passed, the couple climbed out of their truck to find their property destroyed. They own five mobile homes on the property and all were obliterated except one. "At first when she told me she lost everything on the phone, I thought she was exaggerating," said Lopez's son, Josh Bryant. "But she wasn't. That was an understatement." 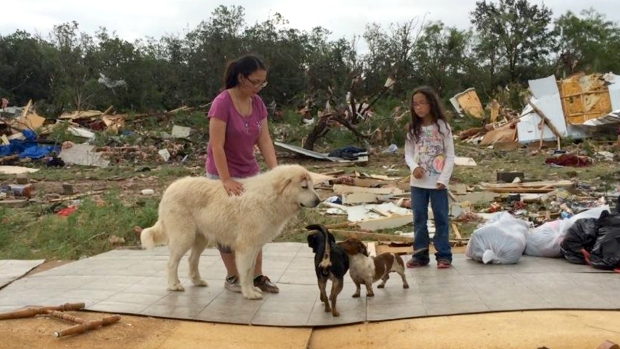 Among the damage, the most heartbreaking scene at the family's lot were their animals, including a lone horse looking for food among the devastation and one of the couple's dogs, Sasha, bleeding and stunned laying on top of the damage. Sasha, along with several other dogs, was caught right in the tornado's path rode out the storm. NBC 5 reporter Jeff Smith posted Sasha's picture on social media, and Sasha was soon reunited with her owners. Almost immediately NBC 5 viewers wanted to help, especially Jo-Anna Hehir, who lives in Roanoke. "So I said, 'Well, I don't live that far. Let me see if I can come help her," Hehir said. Meanwhile, NBC 5 reporter Amanda Guerra worked to find a veterinarian to help the family, who said they didn't know how to get Sasha help because all of their belongings, including cars, purses and wallets, were destroyed. Dr. Bill McGee of Bridgeport Animal Hospital was more than willing to take care of the animals. "These dogs saw some stuff last night. It was traumatic. It's traumatic for them, too," said Hehir. Lopez said she couldn't be more grateful for the help. "They're our family. We have every little animal you can imagine," said Lopez. "We can never thank you enough, for something like that," Lopez told Hehir.